To feel and perform your best, you don’t just need enough sleep, you need enough quality sleep. 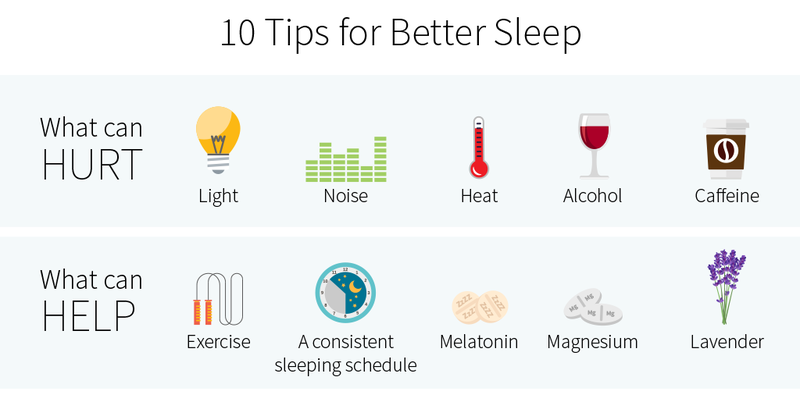 We break down what you can do — and what you should avoid — to sleep well and wake up refreshed. Our evidence-based analysis on creatine features 96 unique references to scientific papers. This page features 96 references. All factual claims are followed by specifically-applicable references. Click here to see the full set of references for this page. Sleep is important. It allows your body to recover, but also to perform vital metabolic processes — such as the cleanup of toxic proteins in the brain, a mouse study showed. And of course, during REM sleep, your “sleeping” brain is very busy consolidating short-term memories into long-term memories. Unsurprisingly, lack of sleep has been associated with a multitude of health issues. It has been shown to increase inflammation and impair focus, fat loss, insulin signaling, testosterone production, and cardiovascular health. More recently, it has also been associated with higher odds of inadequate hydration. Getting enough sleep — enough quality sleep — isn’t only a health necessity, either; it can also help you perform better mentally, physically, and sexually, and it can certainly make you a lot happier! So let’s review some of the sleep-improvement methods available to you. 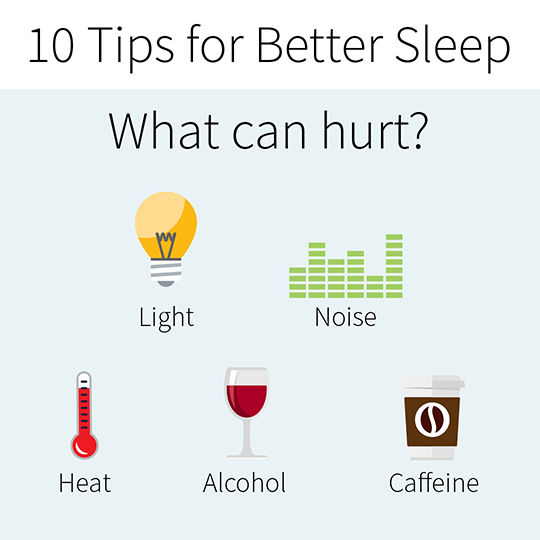 Before we investigate what can benefit your sleep, let’s examine five factors that can impair it: light, noise, heat, alcohol, and caffeine. Light helps regulate the human biological clock, notably through melatonin, a hormone that signals your body that it’s time to sleep. Blue light — which is produced by the sun but also by the screens of TV sets, computers, and smartphones — disrupts your production of melatonin. Yes, if it emits blue light, even the small screen of a smartphone can make it harder for you to fall asleep. A small randomized crossover trial examining the impact of smartphones with and without blue light found that, even though smartphones with blue light didn’t significantly affect serum melatonin levels, they still reduced sleepiness. So if you have to use electronics before bedtime, consider installing a program that gradually reduces blue light from the screen after sunset. Fortunately, more and more devices come with such a program preinstalled (e.g., Night Shift on iPhones and Macs). But what if you can’t easily adjust the color balance of your screen? Or if the blue-light source is a lighting fixture in a room you share with other people? In such instances, consider wearing blue-light-blocking glasses a couple of hours before bedtime. Remember, however, that though blue light is the main offender, you should avoid any bright lights in the hours leading to sleep. Finally, know that even when you’re already in the land of dreams, light can still impair the quality of your sleep. If you live in an area where light pollution is a concern, consider completing your dark therapy by installing blackout curtains or using a sleep mask. To fall asleep faster, avoid bright lights and blue lights within the two hours before bedtime; if necessary, use blue-light-blocking glasses or a program that reduces the blue light from the screen of your computer, tablet, or phone. To sleep better, make your bedroom dark; if you can’t, consider using a sleep mask. As we’ve just seen, lights that don’t keep you awake can still impair the quality of your sleep. Similarly, sounds that don’t wake you up can still increase stress and impair the quality of your sleep. Not all sounds will have the same impact, however. Sudden noises are more likely to disturb your sleep than constant noises. For instance, the noise of your running air conditioner might not bother you too much — it might even provide soothing white noise and mask more bothersome outside noise — but the same air conditioner may disturb you, or even wake you up, if it abruptly starts while you’re asleep. The noises most likely to disturb your sleep are those that carry meaning. At equal volume, two people talking are more likely to wake you up than instrumental music, and you might be able to sleep through heavy traffic noise (though not without loss of sleep quality) yet awaken with a start if your baby makes a much softer but disquieting sound. So if you must sleep in a noisy environment (and are not a parent), consider getting earplugs. Keep in mind, however, that earplugs attenuate high frequencies more than they do low frequencies — they may protect you against cars honking, but not much against traffic rumble. Fortunately, honks, being sudden noises, are more likely to wake you up than traffic rumble; but traffic rumble, if loud enough, can still impair the quality of your sleep. So yes, as a rule, light and sound should both be minimized. Each has its use, however. A small, warm nightlight may reassure children and help them fall asleep (though it can also impair the quality of their sleep if left on overnight), and soothing music may help older adults with insomnia (though the volume should be kept low). Noise can drastically reduce the quality of your sleep. If you can’t make your bedroom silent, use earplugs (unless you need to hear your baby calling). Some people appreciate white noise or soothing music, especially when it masks more irritating sounds, such as traffic noise; but keep the volume low. Elevated core body temperature has been associated with insomnia. Thus, if your bedroom is too warm — warm enough to raise your core body temperature — you may have trouble falling asleep and are likely to experience a decrease in the quality of your sleep. Conversely, reductions in core body temperature have been associated with reductions in sleep latency. Thus, if your bedroom is cool — cool enough to lower your core body temperature, but not so chilly as to be uncomfortable — you may fall asleep faster and enter the deeper stages of sleep sooner. Even if high temperatures don’t prevent you from falling asleep, you should still strive to sleep in a cool room, for heat can impair sleep quality more than noise does. Ambient heat can delay sleep onset and reduce sleep quality. Conversely, a comfortably cool room can reduce the time it takes you to fall asleep and enter the deeper stages of sleep. Alcohol is a depressant of the central nervous system; it causes relaxation by binding to GABA receptors in the brain. In other words, alcohol helps you unwind; and you may think it helps you sleep better. The research, however, shows otherwise. Yes, at first, alcohol can help you fall asleep, but this effect fades off after a few days if you keep drinking close to bedtime. And right from the start, it will impair the quality of your sleep. Ironically, alcohol-use disorders have even been linked to insomnia, though their being cause or consequence is uncertain. Don’t use alcohol as a sleep aid — it might help you relax, but it will impair the quality of your sleep. You may find it beneficial to avoid alcohol after dinner. Caffeine is usually safe and it certainly has its benefits, but it also has some downsides. Caffeine can block different adenosine receptors in the brain, with varying effects. By blocking the A1 receptor, which promotes sleepiness when activated, caffeine can increase alertness. By blocking the A2A receptor, caffeine can increase dopamine levels, with stimulating and mood-enhancing effects. The A1 receptor doesn’t seem to get desensitized, which may be why caffeine doesn’t lose its awakening effect. The A2A receptor does get desensitized, however, which is why coffee veterans don’t feel true stimulation even after drinking several cups — and why some people choose to cycle caffeine. Because they no longer feel stimulated, coffee veterans often imagine that caffeine won’t affect their sleep. Indeed, many people can fall asleep with caffeine coursing their veins. Yet even as they slumber, caffeine makes them more alert and their sleep more shallow. For that reason, caffeine should be avoided within the six hours before bedtime. Even if it doesn’t prevent you from falling asleep, caffeine can still impair the quality of your sleep. Avoid it within the six hours before bedtime. To protect your sleep, avoid alcohol after dinner and caffeine during the six hours before bedtime. You should also avoid bright lights and blue lights during the two hours before bedtime and, as much as possible, shun all light and noise while you sleep (earplugs and a sleep mask may help). Finally, you’ll sleep better in a cool place. 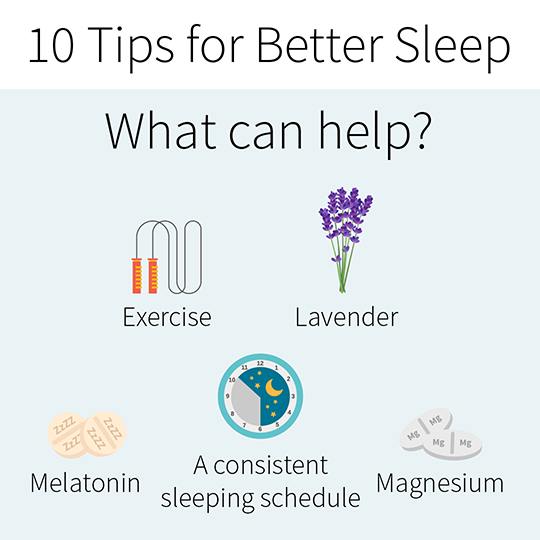 Now that we’ve examined what can impair your sleep, let’s investigate five factors that can benefit it: exercise, a routine, melatonin, magnesium, and lavender. Sleep better, exercise more. Exercise more, sleep better. Is either true? 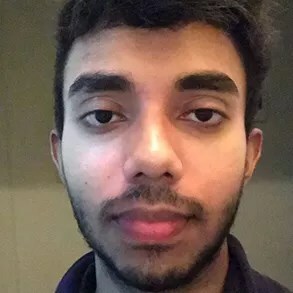 Both? Even well-run studies don’t always agree, partly because they don’t always focus on the same population. A 2013 study in 11 women suffering from insomnia found that better sleep led to more exercise, but that more exercise didn’t lead to better sleep. Conversely, a 2014 review reported that better sleep didn’t lead to more exercise, but that more exercise led to better sleep. Sleep better, exercise more. This statement probably applies only to people who want to exercise in the first place — people who might skip a workout if a bad night made them too tired. Skipping workouts isn’t the only problem, however. A 1989 review found that, even when they found the will to exercise, sleep-deprived people got tired faster. And of course, when exercising brings pain, a bad night makes it all the more tempting to skip a workout or shorten it; and indeed, a 2014 study in 119 chronic-pain sufferers found that bad sleep led to less exercise. Finally, a 2008 study found that bad sleep could also lead to worse exercise (lesser power output). Exercise more, sleep better. This statement is backed by most studies. Although the exact mechanisms are not yet clear, physical activity during the day seems to improve sleep quality, especially in times of stress. Many types of exercise — from meditative movement, such as yoga and tai-chi, to something more intensive, such as aerobic exercise or resistance training — have the potential to improve sleep quality, as well as mood and overall health. But exercising at night is bad, right? Well, yes and no. Physical activity does raise your core temperature, which we’ve seen isn’t conducive to sleep, but that increase is temporary. Exercising also increases your production of epinephrine (a.k.a. adrenaline), but that increase too is temporary and so should only affect your sleep if you jump directly from the lifting bench to your bed, without even taking the time to shower. More importantly, nighttime exercise has the potential to disrupt your circadian rhythm, since your body associates activity with day. However, it appears that exercising at any time, even at night, is better (with regard to sleep quality) than not exercising at all. Everyone is different, though, so if you discover that exercising too close to bedtime disrupts your sleep, try finding another workout window. Physical exercise during the day leads to better sleep at night. Nightly exercise is better than no exercise, with regard to sleep quality and other health factors, but it can disrupt the circadian rhythm of some people. Your body is a giant clock that counts each second and records every year. Most physiological processes follow a 24-hour schedule, based on clues such as temperature and light (which is why artificial light reinforces the tendency to keep an inconstant sleeping schedule). This 24-hour schedule is your circadian rhythm, and by throwing it into disarray, an inconstant sleeping schedule is likely to impair the quality of your sleep. Going to bed at approximately the same time every night can improve sleep quality as well as reduce the time it takes you to fall asleep. To further consolidate your circadian rhythm, a bedtime routine can help — by signaling your body that it’ll soon lie down for sleep. This routine can be as simple as showering and brushing your teeth, or it can involve a set amount of time spent reading or meditating. Your bedtime routine shouldn’t include any activity that strongly stimulates the senses, such as playing games. Finally, keep in mind that the screens of your TV set, cell phone, and computer all produce blue light, and that blue light disrupts your production of melatonin, a hormone that signals your body that it’s time to sleep. Going to bed at around the same time every night can help you to both fall asleep faster and sleep better. A bedtime routine can prime your body for sleep; your routine should be more soothing (e.g., meditating) than stimulating (e.g., playing a computer game). The absence of blue light signals your body to produce melatonin, which in turn signals your body that it’s time to sleep. For that reason, it is important that you avoid blue lights during the two hours before bedtime. If you’ve taken that step and the others described above yet still have trouble falling asleep, you could try taking melatonin as an oral supplement. Oral melatonin may help alleviate insomnia, reduce sleep latency, and improve sleep quality, including in children and the elderly. It can also help fight jet lag, and so is especially popular among frequent travelers. Don’t imagine, however, that oral melatonin will allow you to shift your sleeping schedule at will, regardless of where you live. When all is said and done, light is still a stronger regulator of your body’s melatonin rhythm (the circadian rhythm of your body’s production of melatonin). The good news is that, according to studies lasting between one week and one month, supplementing melatonin doesn’t seem to affect your own production. Finally, it is worth mentioning that many melatonin supplements don’t have the amounts indicated on their labels — some have much less, which is bad; others much more, which is worse. According to studies as old as twenty years ago and as recent as last year, some melatonin supplements even contain contaminants, such as the neurotransmitter serotonin. If you have implemented tips 1 through 7 in this article yet still have problems falling asleep, you could try taking melatonin near bedtime. Oral melatonin can also improve the quality of your sleep and help you fight jet lag, but it won’t allow you to change your sleeping schedule at will. Lack of magnesium, a dietary mineral that plays an important role in the brain, can result in abnormal neuronal excitations leading to impaired sleep. Supplemental magnesium has been shown to improve sleep quality in the elderly, who tend to have relatively low magnesium intakes. While the elderly are especially at risk, magnesium deficiency isn’t unknown in younger people — notably athletes, since magnesium is lost through sweat. Yet getting your Recommended Daily Allowance should be easy: magnesium-rich foods are numerous and can fit all kinds of diets. If you still feel the need to supplement, keep in mind that supplemental magnesium is more likely than dietary magnesium to cause adverse effects, which is why the FDA fixed at 350 mg the Tolerable Upper Intake Level for magnesium supplementation in adults. Also, you may want to avoid magnesium oxide: it has poor bioavailability (rats absorbed only 15% in one study, humans only 4% in another) and can cause intestinal discomfort and diarrhea. Lack of magnesium can impair sleep. Multiple types of magnesium supplements exist, but magnesium-rich foods are numerous and can fit all kinds of diets: they should be your first option. If your body has enough magnesium already, supplementing with more won’t benefit your sleep. Among the many possible causes for lack of sleep, two of the most common in our modern world are stress and the simple fact that many people don’t schedule enough time for sleep on a daily basis, instead hoping to “catch up” during the weekend (a strategy with very limited efficacy). No powder or pill will allow you to cram eight hours of sleep into six hours, unfortunately, but some supplements might help mitigate stress. One of them is magnesium, presented above, though supplementing with magnesium will only help if your body’s levels are low. Another is lavender, whose scent was shown to promote relaxation, alleviate insomnia, and improve sleep quality. The difficulty of blinding aromatherapy studies, however, somewhat weakens the existing evidence. Studies on oral supplementation are more recent, and most of them used a proprietary extract: in people with anxiety, Silexan™ was shown to alleviate anxiety, improve sleep quality, and increase sleep duration. Finally, a word of caution. The Endocrine Society and the National Institutes of Health warn that there is mechanistic and anecdotal evidence that lavender oil has estrogenic properties and can cause gynecomastia (enlarged breasts in males). Although none of the clinical trials referenced above have reported gynecomastia among their subjects, if you’re male and your breasts become tender, stop using lavender. If stress or anxiety hurts your sleep, then lavender may help (as may magnesium, if your body doesn’t have enough). However, men should be aware that lavender could have estrogenic properties. To optimize your sleep, avoid the factors that can impair it, exercise regularly, go to bed at the same time every day, and make sure your diet contains enough magnesium. If, despite all that, you still have sleep issues, you could try supplementing with melatonin (especially in case of jet lag) or lavender (especially if stress is what impairs your sleep). Our constantly updated Sleep Supplement Guide is a complete, precise, step-by-step guide on supplementing for better sleep. Finally, if you’ve done everything you could to improve the quality of you sleep yet still wake up tired for no obvious reason, ask your doctor to make sure you don’t have sleep apnea or another sleep disorder. Do I need to cycle caffeine? How does caffeine work in your brain?